It’s the connection we have with nature and mountains, wandering steps into the unknown, budding flowers at the foothills, drifting clouds over towering peaks, huge expanses to rest your gaze upon. It’s a way of life, and something all outdoor loving parents would wish to pass onto their children. However, there is a minor setback. 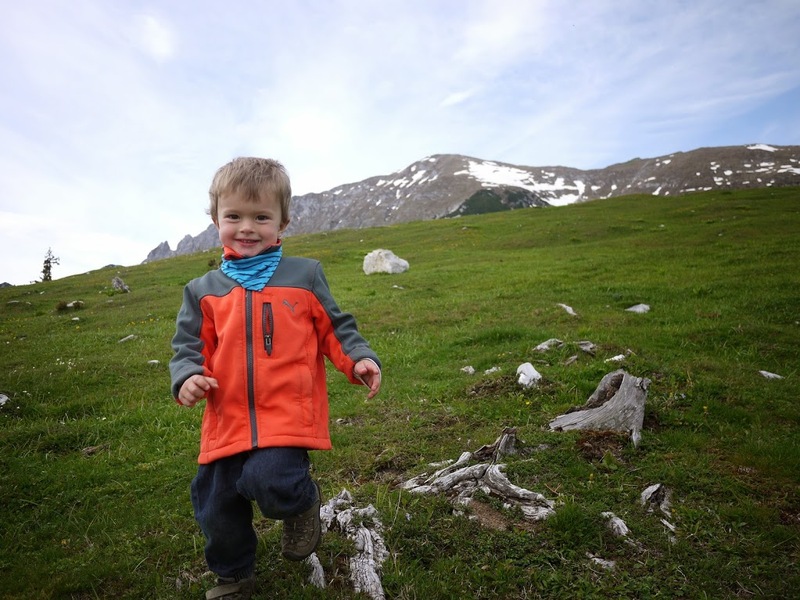 Children, at least the little ones, have no real desire for walking a few miles uphill on a seemingly monotonous trail, raising the question for many mountain lovers out there, how and if at all, push their efforts to make hiking a family thing. Father - daughter bonding in the mountains. Photo by: Exploring Slovenia. While the easiest thing to do is to simply drop the kids off with their grandparents or a nanny and enjoy the outdoors on your own, it somehow seems unfair. Unfair to the children, who deserve quality time with their parents; unfair to the grandparents, who’ve already finished bringing up youngsters of their own; and finally, unfair to the parents, who sooner or later end up frustrated about their own children not following the values they aspire to so much. That’s why, if you love mountains, bring your kids along, prepare for the battle and the nagging, for countless stories and games, because in the end it’s always worth it. At the top of Mt. Snežnik, Slovenia. Photo by: Exploring Slovenia. With two small children in tow, trust me when I say I’ve been on both sides – on the verge of a mental breakdown wanting to give up family hiking altogether, but then again also exhilarated and endlessly proud when they finally did fire up those engines and rocketed to the top. The secret is in keeping them motivated. Kids love climbing via ferrata, but make sure you use recommended safety gear like a helmet, a lanyard protection system, and a harness. Photo by: Exploring Slovenia. So, how do you motivate a child to hike up a mountain? 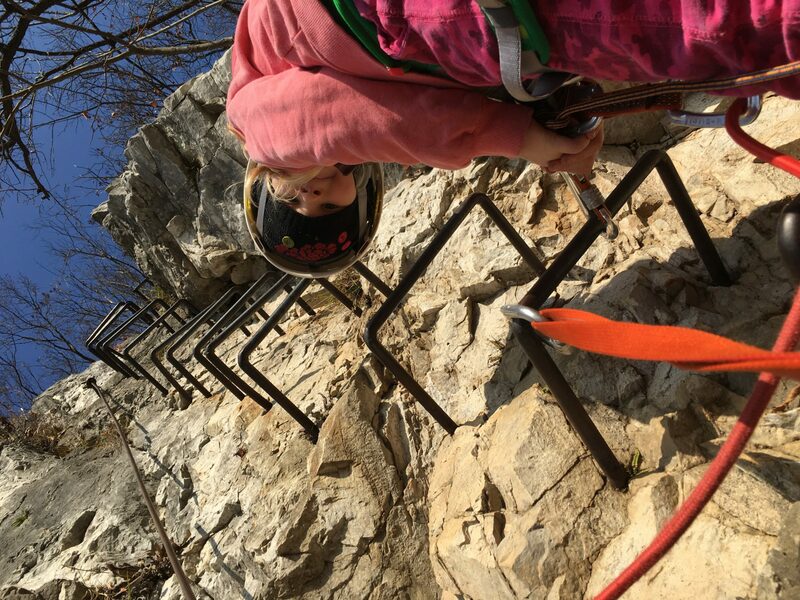 As impossible as this may sound, your kid is capable of climbing some serious trails. If an average 3-year old can climb a 1,000-Ft hill (300 m), you can add another 500 Ft (150 m) elevation to your goal each year, so when your kid is big enough to read fluently, he can also climb a 3,000-Ft mountain (900 – 1,000 m) on his own. The ability alone doesn’t tell the whole story though, since your little one needs an extra big push to start moving in the right direction in the first place. That’s why we’ve made a list of eleven tips to help you motivate and prepare your child better for hiking. 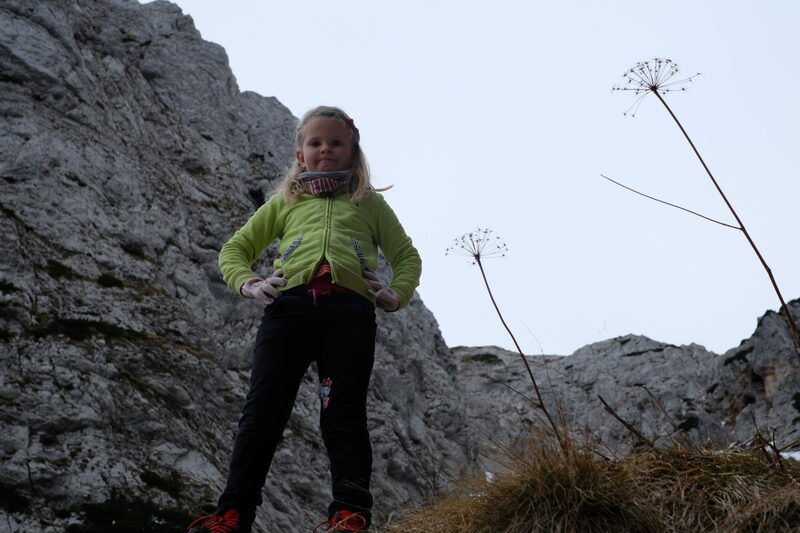 My daughter’s first experience in the high mountains at the age of 6, making 2,930 Ft (893 m) elevation gain to a mountain pass just below the highest mountain of the Kamnik-Savinja Alps in Slovenia. Photo by: Exploring Slovenia. If you thought it would be a good idea to wait until your kids were a bit bigger and smarter before they were ready to break through into mountaineering, think again. Rather than wait for perfect timing, your motto should be “start small and think big”. Growing to love the mountains and nature doesn’t come overnight; it’s a habit that you and your kids need to cultivate slowly over years. 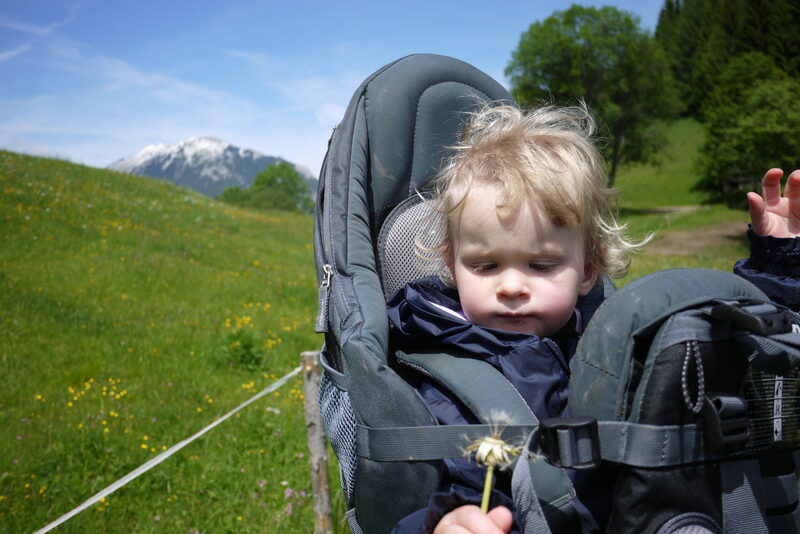 Truth to be told, hiking with small kids is a pain, but once in the mountains, they absolutely love it! Photo by: Exploring Slovenia. First, pick a goal for the day to match the physical fitness level of the weakest link. Although we’ve all probably seen bright exceptions in our hiking history, the general rule “the smaller the child, the easier the goal” pretty much applies to all children. Second, the goal itself must feel like a reward; it’s either cuddly animals at the top, a small playground, water to play with, or anything else it might do the trick. 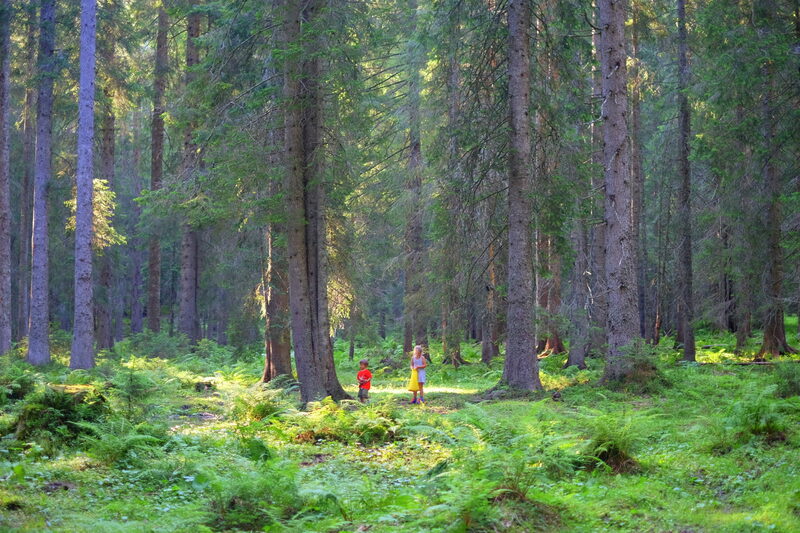 Bear in mind that beautiful scenery is the last thing your kid will appreciate after their walking marathon. We love a mountain hut Kofce in the Karawanks. It has cows and horses in the summer, plus a small playground to keep them busy. Photo by: Exploring Slovenia. Let your kids set the pace or you’ll bump into resistance very soon. 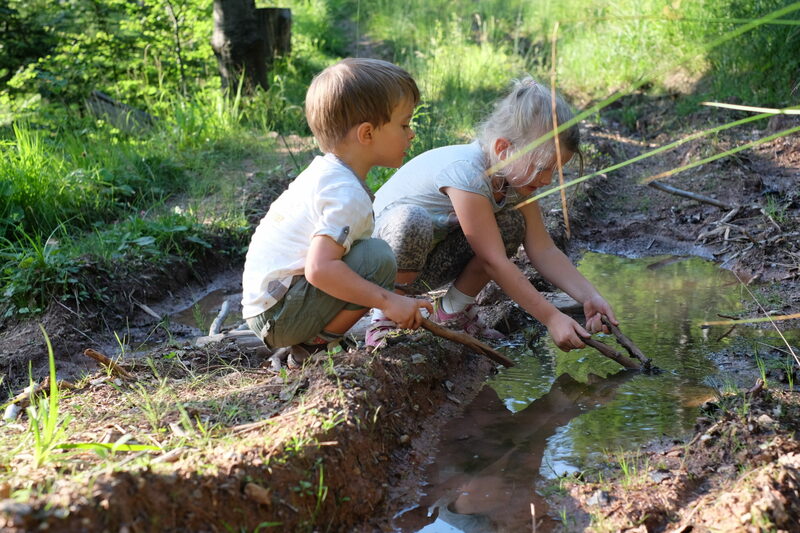 If they decide to pick through a puddle with baby frogs, join them and explore the funny looking creatures together. That small muddy spit of a puddle can always serve as a great excuse for your next hiking trip. Yep, they are picking at a muddy puddle full with baby frogs. Photo by: Exploring Slovenia. Make hiking a fun experience filled with laughter, a sense of adventure and exploration. 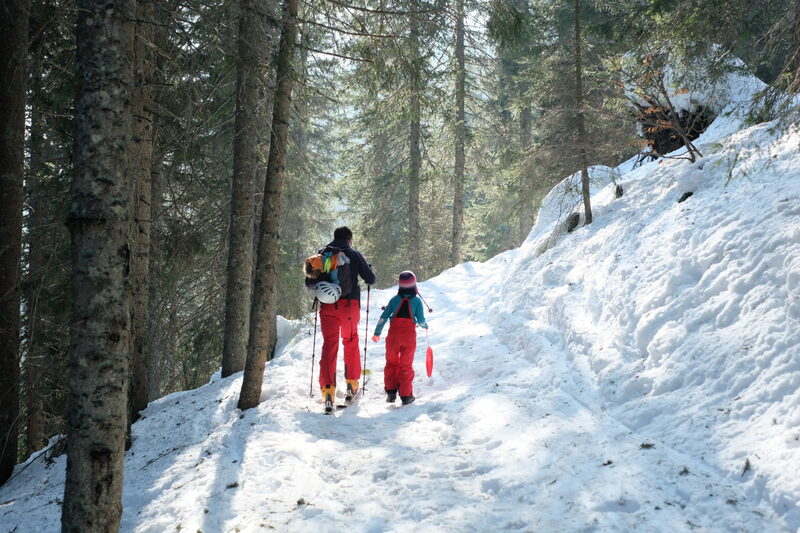 Rather than bring your children home clean, encourage them to get dirty – to crawl over steeper parts on all four, climb on a boulder even if they rip their pants doing it, or throw themselves in the soft snow and slide back down on their behinds. With that in mind, dress them in comfortable clothes, over which you won’t lose your mind if they get ruined, and water-resistant snow pants in the winter. Don’t forget to brings some extra clothes along because they will get wet. 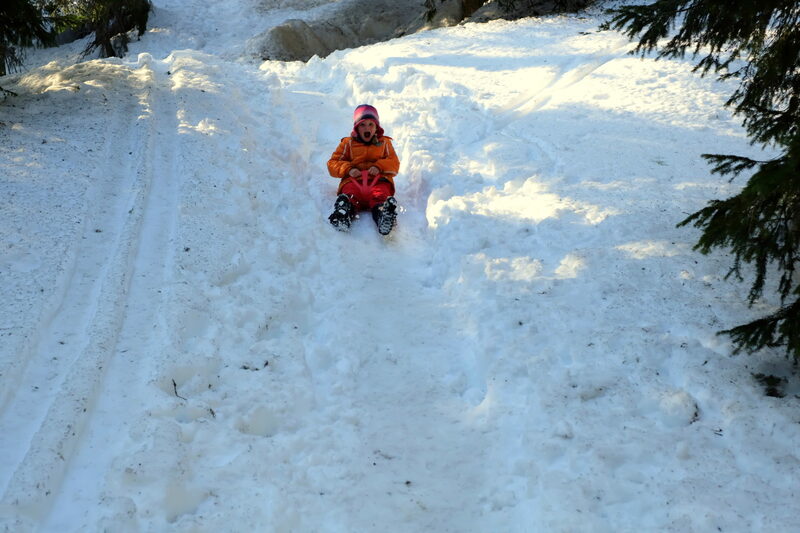 Snow sled glider is easy to carry up and can be a game changer for getting down. Photo by: Exploring Slovenia. If truth be told, it’s easier to climb three times the mountain alone than once with the kids. Me and my husband usually take turns in entertaining the kids while hiking, while in the final stage, when both children start losing their drive and hopelessly push towards the point of no return, or in our case – super quick return, we usually switch to a one-per-one entertainment, boosting morale with their personal favorite games. It’s either hide and seek, treasure hunting, animal guessing, animal tracking, mushroom picking, never-ending story-telling, or just a simple game we make up on our own. Absorbed in picking mushrooms at the start of the trail to the Blejska Hut above Pokljuka. Photo by: Exploring Slovenia. You heard me right, more little grouches! But just like in algebra, where a double negative resolves to a positive, here also double hiking grouches surprisingly make a positive team. Hiking with a buddy is encouragement on a completely different level. Peers enjoy sharing an outdoor experience as they have games of their own, private talks and secrets, while that little shred of constant rivalry tends to work in your favor boosting their pace to full speed. 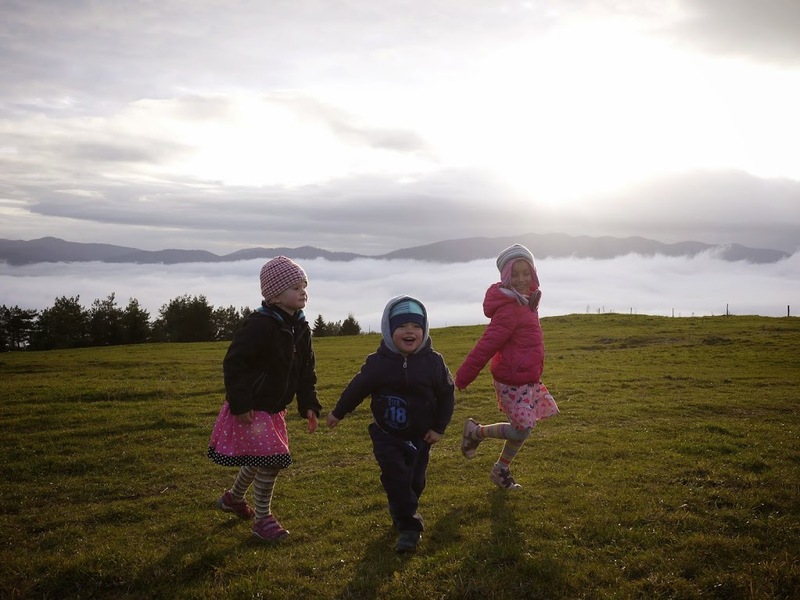 Two 5-years olds and a 2-year old having a blast going up a hill called Slivnica with an elevation gain of about 1,700 Ft or over 500 m. Photo by: Exploring Slovenia. Plan flexible trips and be prepared to shorten them if the strength leaves your little fellow walker somewhere in the middle of the trip. What you can do is to give them some time, snacks and water to regain their energy, and if that still doesn’t work, turn back. Better to collect good memories than to push forward a tired child, right? We picked a wrong day for the mountains – extremely windy with zero visibility at the top. 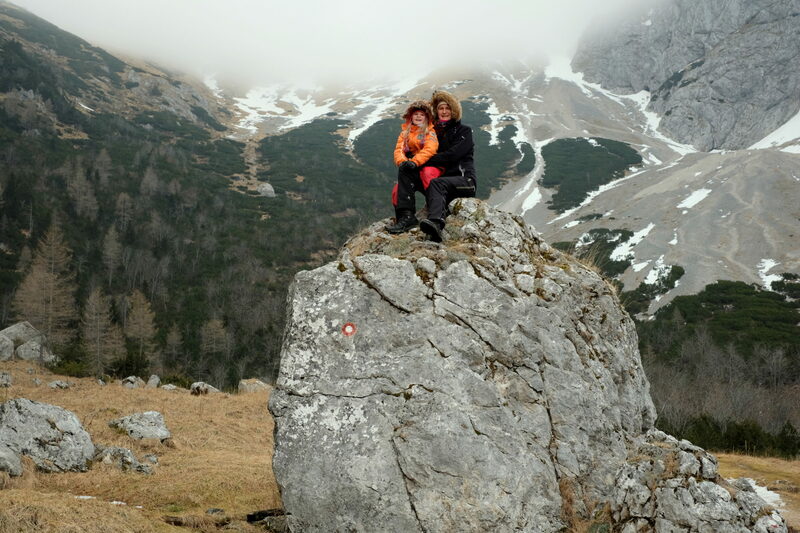 This was supposed to be our last photo before we turned around, but then our daughter insisted on going further on until we finally reached the top of a mountain pass Kamniško Sedlo. 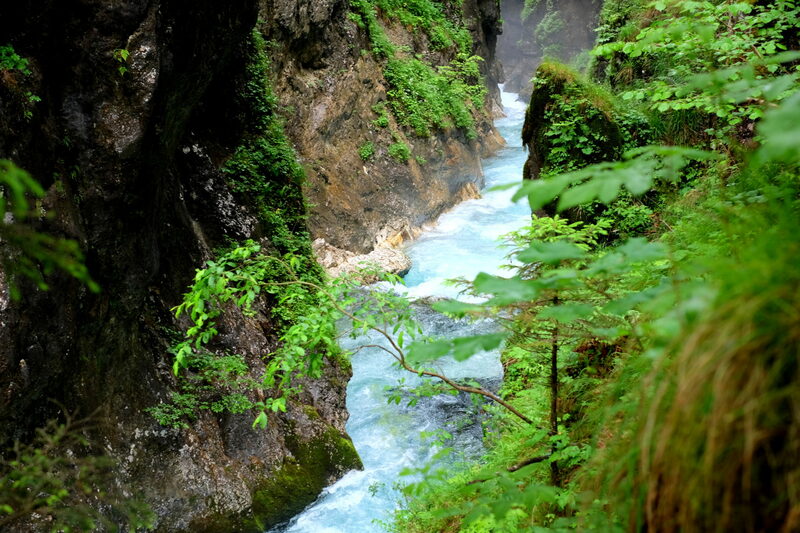 Elevation gain: 3,165 Ft or 964 m. Photo by: Exploring Slovenia. Although I’m generally against a reward system and prefer the good old common sense upbringing, having hiked a decent trail your kid deserves a small prize. 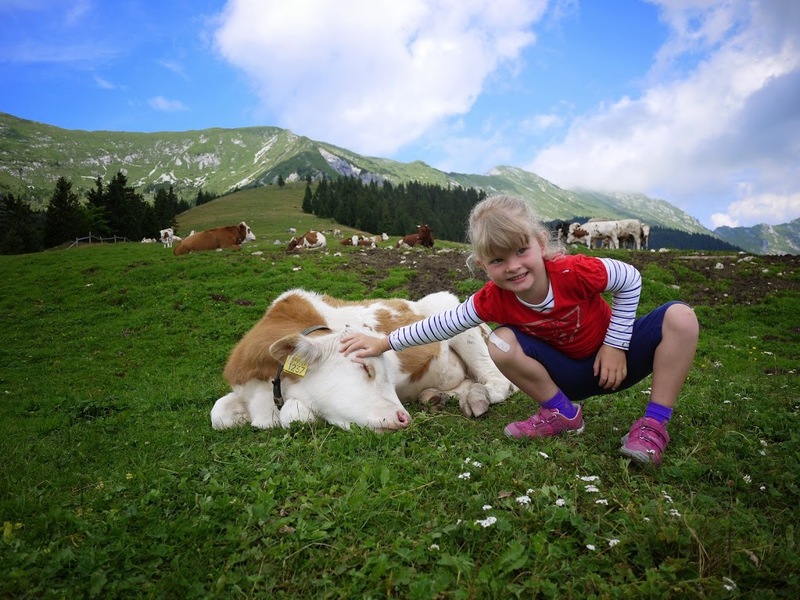 Whether you reward them with a cookie, berries, a cartoon on your phone, or a giant snowman built together, you will reinforce the positive in their growing connection with the mountains. Nevertheless, to make the trip a fulfilling experience as a whole, avoid promising the reward beforehand and rather surprise them with a treat instead. After a 3-hour hike towards Mt. 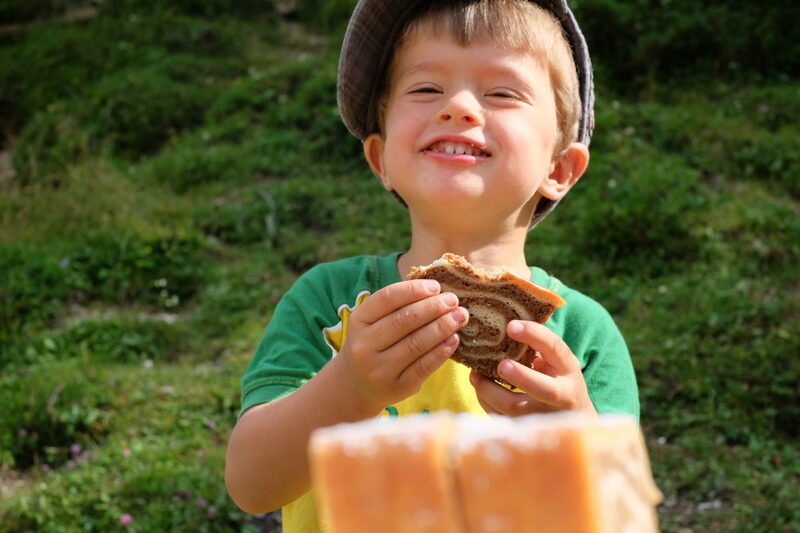 Debela Peč, 6,600 Ft or 2,014 m, he was thrilled to get a piece of a traditional Slovenian pastry, potica. Photo by: Exploring Slovenia. Children are in it for the adventure, for the fun, and you should make sure they get some. 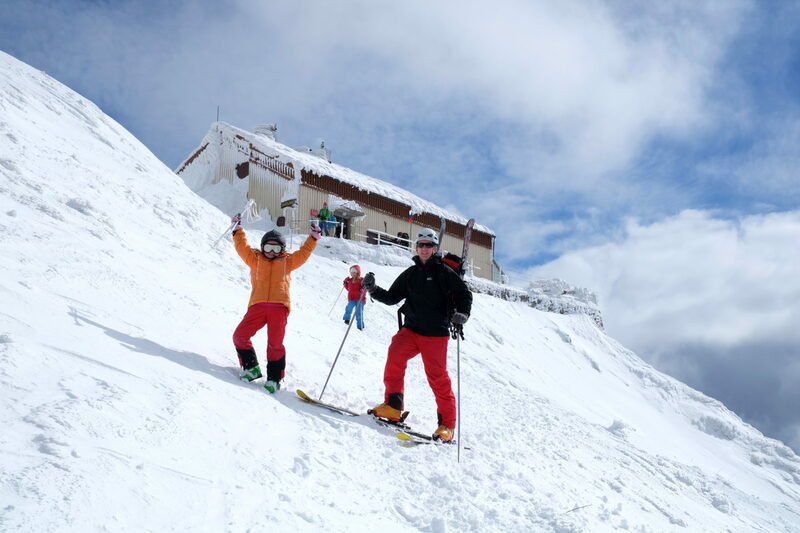 If your child already masters difficult slopes on skis, why not give an off-piste adventure a try. And if he is a natural biker, bring his bike along and make him taste some of the downhill action. Get on those skis and start rolling! 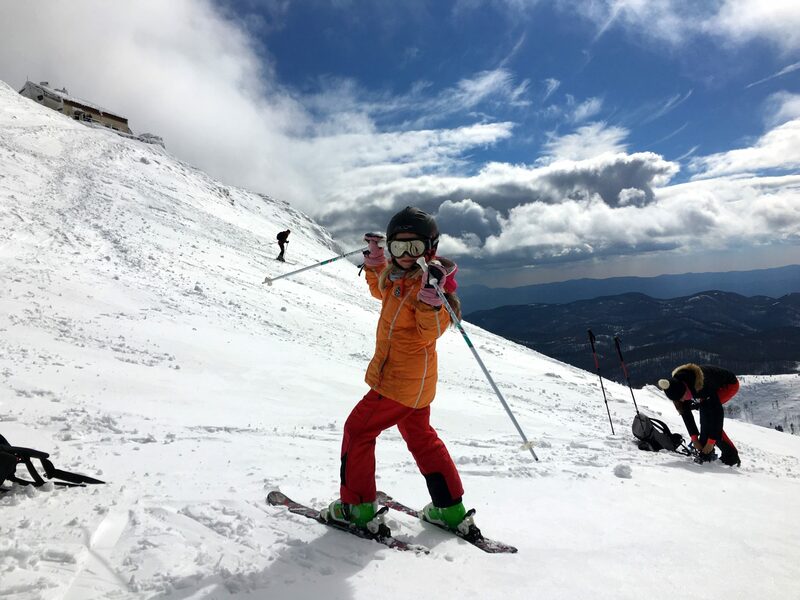 Meet the bravest 6-year old who nailed her first off-piste skiing from the very top down a 1.796-m or 5,900-Ft mountain. Photo by: Exploring Slovenia. What about babies and toddlers? Although your little ones require special care and more attention than the older kids, they’re still not fragile. Moreover, your baby or a toddler is small and light enough to be carried up and if that’s not a reason to celebrate, I don’t know what is. But do yourself a favor and save your spine on long-haul hikes and invest in a comfortable backpack carrier which should make lugging the junior around a lot easier. The key to success is in keeping them busy. Photo by: Exploring Slovenia. While hiking as a family is great, your older child also needs some quality time alone with you or possibly both parents. Choose a more difficult trail and let him lead the way; you’ll be surprised at the amount of effort she is capable of with the right motivation. 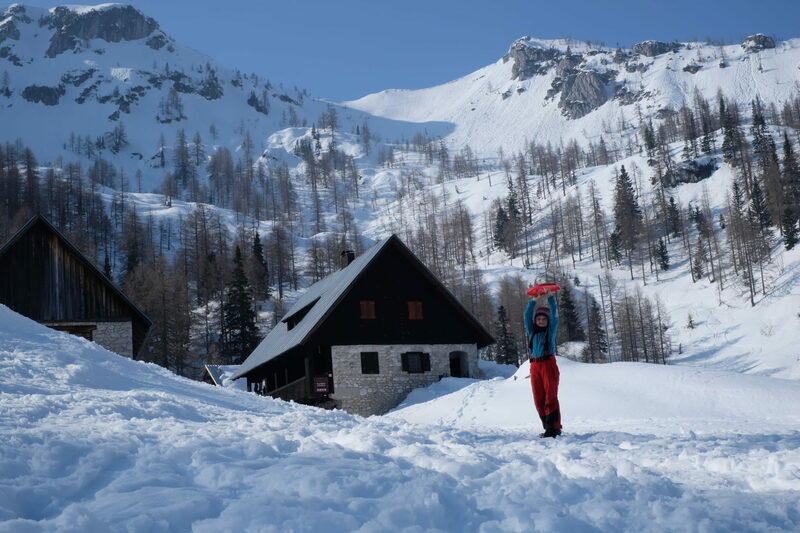 Our six-and-a-half year old daughter walked for 7 hours in knee-deep powder snow to the Blejska Hut, 1,630 m or 5,350 Ft, and back since the local road to the usual starting point was closed. Photo by: Exploring Slovenia. All in all, passing the love for the mountains to your children is a long-term process that requires involvement and patience, but incredibly rewarding and in the end worth the effort. There’s nothing like seeing your child marvel at and embrace things that inspire you too. Follow us on Facebook, Twitter, Instagram, Youtube and subscribe to the feed.